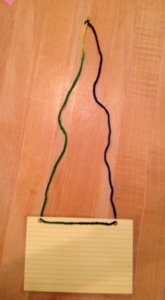 Nora gave me the great idea in a comment on my Math Stations post about making necklaces out of index cards. 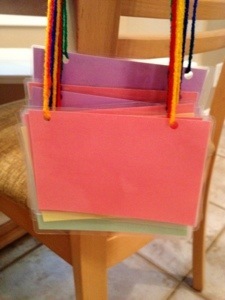 I laminated index cards, punched two holes in them, and then put string in them to make dry-erase index card necklaces. When the students come in, they can write their fact on their necklace and wear it. Whenever they speak, they must introduce themselves (ie – 12×6 would be called 72! And whenever anyone speaks to them, they must call them by their multiplication name (72). 10 x 10 x 10 on a card, their name is 10 cubed (or the other way around). Turn the cards around so they are on their backs. Put a vocab word on it and then 5 kids have to write an example on your card. Turn it around and then see which ones are correct. That’s all I have for now. But if you have a brilliant idea (and I’m sure that you do! ), please leave it in the comments! 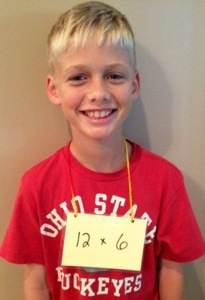 This entry was posted in Activities, Made 4 Math and tagged activities, multiplication facts by I Speak Math. Bookmark the permalink. I don’t know about brilliant but here it goes…. The student who is wearing that problem is going to remember that particular one better than anyone else in the room. So, I love this idea for that fact alone. “Remember when I was 72?” Anyway, in addition to what you have written, how about the students each have a list of their classmates names. They roam around the room answering each other’s problems. When someone answers your problem correctly, you cross off their name. If someone gets your problem incorrect, give them a hint (maybe hints could be written on the back of the index cards??) until they get it correct. Your students continue in this manner until all names are crossed of the list. This way the students are doing many problems, each student is learning their problem in-side-out, and you, well you are sitting at your computer reading your favorite blogs!!! The cards look great! I really like it when someone takes an idea from somewhere, bends it a little bit, adds a pinch of local context, and creates something amazingly useful. Well done! I already mentioned on Twitter but I’ll add it here too. Put a number on each card. Students have to group based on a certain number subset. Some belong. Some don’t. Could look at the characteristics of that subset. Students wearing a decimal must be called by the fraction or percent (or vice versa.) Groups of students need to line up in order based on their value. Draw a little coordinate plane on each card and plot a point. Student need to be called by their coordinates. Not sure how well it would go over with eighth graders . . . but I know sixth graders will have a blast! Wow, I love all of your great ideas. Every time I see an e-mail in my inbox from your blog, I can’t wait to see what you have to share. I love the necklace idea! Just wondering how my 9th graders would react to it. 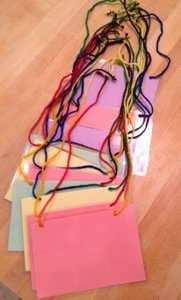 Love the index card necklaces, I used them today. Now I am thinking of all the different ways to use them throughout the year. Today after learning the Real Number System I gave each student a necklace with a number on them and they had to sort themselves. I plan to use them as review all year as they are doing other tasks. i.e. : all the squareroots that would fall between 6 and 7 on a number line go to group 1, or if you are a whole number go to group 2. Think fractions decimals and %. Students have to find their equivalents to see who they are working with during that class. The possibilities are endless. Better late than never – so glad I noticed your tweet! Thanks for sharing the brilliance, as always. Have you ever gotten older children to wear them? I also have 10th grade students in this class and they wore them as well. But, I haven’t tried with other grades. I actually didn’t even bring them out today. But, “Write your letter on your name tag” was in the Trashketball instructions. They asked where the name tags were, but I told them we weren’t going to use them. Then they really wanted to wear them. I think they thought I was holding out on them or something. So maybe tell them you aren’t going to let them wear the name tags, and then they will ask for them. lol. So many great ideas! I was thinking as I read all the different possibilities that setting up the tags every day would be time consuming. So I came up with the idea of having the students write their own each day or whenever we wanted to use them. 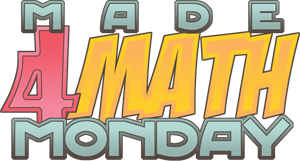 Students keep the tag in their possession, when they arrive to class they check out their math title for the day by referencing a projected list. They use their regular student number (each student has a number to ease filing and returning papers) to determine their number for the day and then write that number, expression, graph, pattern, etc., on their laminated nametag. I can make up targeted lists in advance and reuse/improve on them throughout the year(s). The nametags can be used for groupings, pre/review, number talks, anything! Thanks everyone.